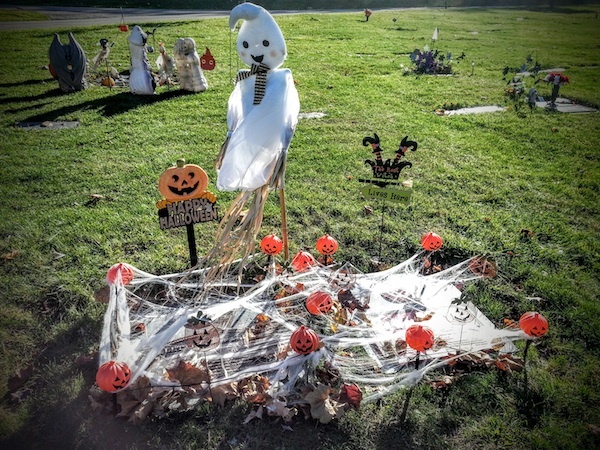 Every October people put great energy into making their homes look like graveyards. The ubiquitous R.I.P. 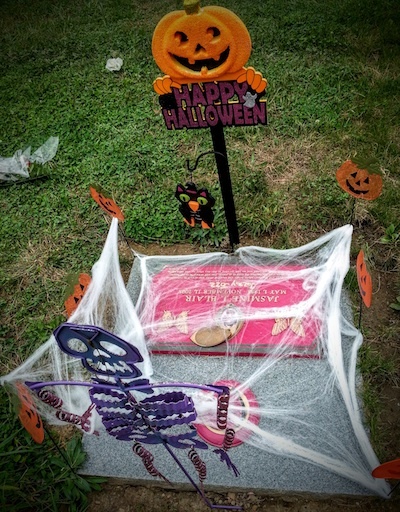 curved-top cardboard or foam-core headstones dot America’s front yards like popped toasters at a diner. In city neighborhoods, sometimes you see these incongruously strapped to stoops and front railings as if somehow there were people buried under the porch. So in real graveyards, what’s the motivation to add additional set dressing to the already universally-understood scariest of locales? 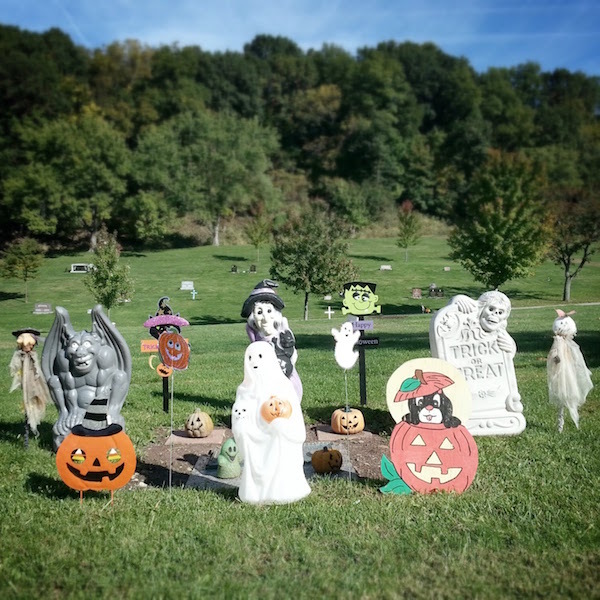 Decorating a grave marker for Halloween strikes this spookworthy blogger as somewhere between questionable in the taste department and just plain redundant. I’ve checked the dates, and none of the deceased were ever either born or died on the thirty-first of October, so that’s not it. 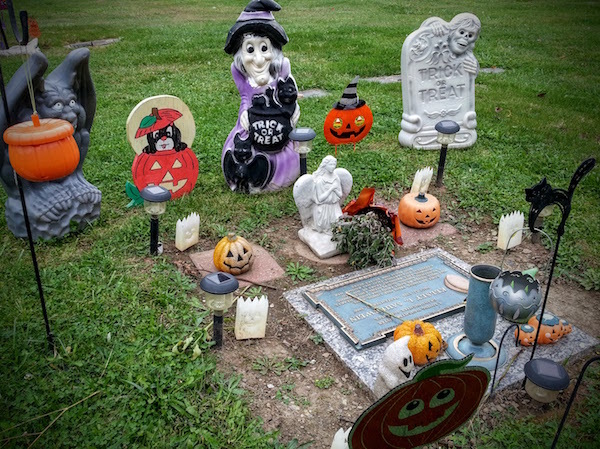 One can only assume then that either the holiday had a special significance for the departed, or that the grave-tenders are so faithful they give the full redecoration treatment every season. 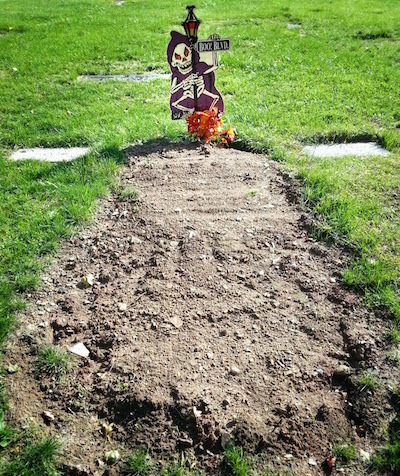 I’ve certainly seen the other holidays represented throughout the year (but not at these specific graves). 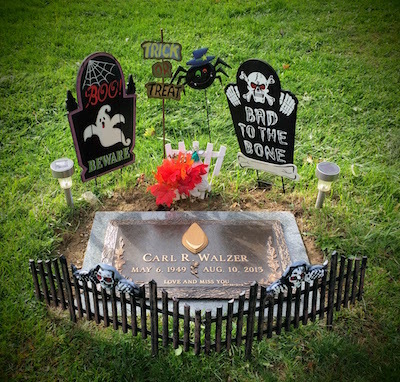 Whatever the reason, the phenomenon of Halloween-decorated graves occurs every year in Allegheny Cemetery. There aren’t a ton of them, but enough that’s it’s definitely a thing. Above are photos from the the same plot over the last three Octobers. 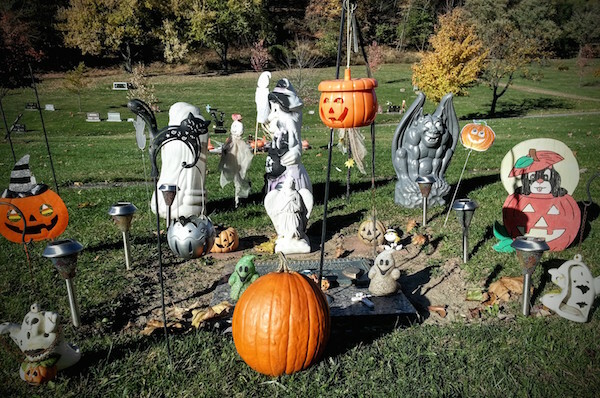 You’ll see a number of repeated pieces–the big gray plastic gargoyle, the 2-D Jack-o-lanterns, the solar lights, the homemade ghost, the Trick-or-Treat grave and ghoul combo–but a lot of the decor either didn’t make it back or had to get re-generated. The park has a strict fall cleanup policy (more about that later) but they seem to leave the Halloween decorations alone, at least through November. Google Maps tells us there’s a Boo Avenue in Kansas City, a Boo Street in Louisiana, and a couple Boo Roads in Mississippi and Indiana. There are apparently more Boo Lanes than any other type of Boo thoroughfare. But Pittsburgh Orbit readers will be excited to learn that the nation’s one and only Boo Boulevard exists right at the end of this freshly-dug grave in Allegheny Cemetery’s section 61. A cloaked skeleton hangs on a old school gaslight to mark the entrance. Does this happen in other cemeteries? I’ve never seen it before. As if I didn’t looove Allegheny Cemetery enough. I have not seen it elsewhere, but I’ve got a pretty small sample size, so who knows? I definitely didn’t see any in Homewood, St. Mary’s, or Highwood this year. A lot of cemeteries have really strict policies about what kind of ornamentation may be left on graves, but then others are pretty loosey-goosey.